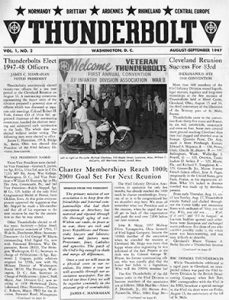 After the establishment of the 83rd Association a magazine was published which was named ‘The Thunderbolt’. The first issue was released in 1947 and ever since it has been a valuable tool for the Association members to keep in contact with each other and to stay informed on Association events, such as the Annual Reunion. At the 2012 Reunion the decision was made to create a digital and paper archive of all issues. The full archive is now online! An accomplishment made possible only through the efforts of our members. We thank all who worked on this project and continue to enjoy this Thunderbolt archive they have created.